If you’re into fluffy and cuddly felines, Kitty Payout will grow your love for these pets. Eyecon has built 5 reels and 25 paylines to benefit from an array of bonus rounds and features. Themed on a Kitty, you can dive into a world where only cats exist and see how they go about their everyday lives. While spinning the reels, find symbols like; toy mice, yarn balls, paw stamps, milk bowls, tuna cans, chains, kitties, A, K, Q, J, 10 and 9 landing on your reels to trigger wins! When you’ve launched Kitty Payout, set your bet levels on the Bet/Line Field. On the same field, set the amount of paylines you would like to put to play by clicking on the up or down arrows. Autoplay is also available on the game, and this allows you to play the game without having to intervene. Amount of Paylines Selection: Choose between 1 to 25 lines. Coin Values: Bets range from £0.01 to £50.00. The scatter symbol is the Kitty, which triggers the bonus round of the game. The Wild Symbol is the Milk Bowl, which replaces all other symbols on the slot grid bar the scatter. Land three, four or five scatter symbols anywhere in view and receive 15, 20 or 25 free spins to play. 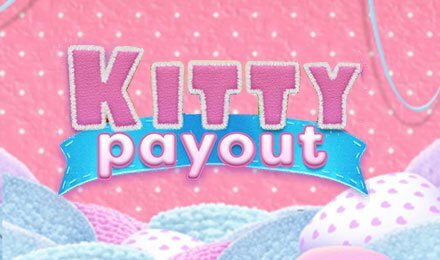 Now you can play Kitty Payout slot at Vegas Spins Casino, and also play on the go! Take your gameplay wherever you go by launching the game on your mobile, desktop or tablet! Are you ready to be surrounded by clowders? Now is your chance!